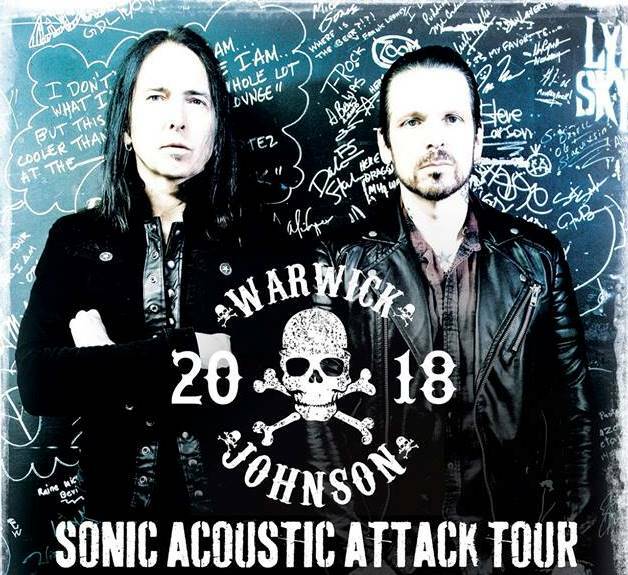 Ricky Warwick and Damon Johnson from Black Star Riders have announced dates for a fall acoustic tour of the UK and Europe. The “Sonic Acoustic Attack” trek (see dates below) will see the duo bring their full on, two hour-plus, acoustic show to intimate venues while featuring a mix of career-spanning material from both artists, including songs from the Alice Cooper, The Almighty, Black Star Riders, Brother Cane and Thin Lizzy catalogues, plus anecdotal stories and much more. “Warwick/Johnson is a great opportunity for myself and Damon to go out and play the songs we love, raw and stripped down with maximum intent on creating a great atmosphere at every show,” says singer Warwick. The six-week run, which will begin in early September with an appearance on Full Metal Cruise 7 before officially opening in Halmstad, Sweden on September 8 – will include an extensive, 18-date run across the UK before it wraps up in Edinburgh on October 14. The pair have previously toured acoustic shows in recent years between tours by Black Star Riders. Still on the road in support of their third album, 2017’s “Heavy Fire”, Black Star Riders recently opened for Judas Priest on the veteran metal band’s North American tour and will next be seen at the Garage Sound Festival in Madrid, Spain on June 9.